Aside from a lamp and a soft doll, Mom’s basket…contains only domestic and “nurturing” items: detergent for baby’s delicate little clothing, diapers, infant medicine, and what looks like various cleaning sprays. Based on the contents of her basket, Mom’s role here is to care for and clean up after the child. Now take a look at Dad’s basket! I do see two bottles stuck in there [and maybe a blanket? ], but more prominently displayed are chips, ice cream, and toys like a guitar and plastic golf clubs. If I had my choice based solely on this picture, I’d much rather be a dad than a mom! 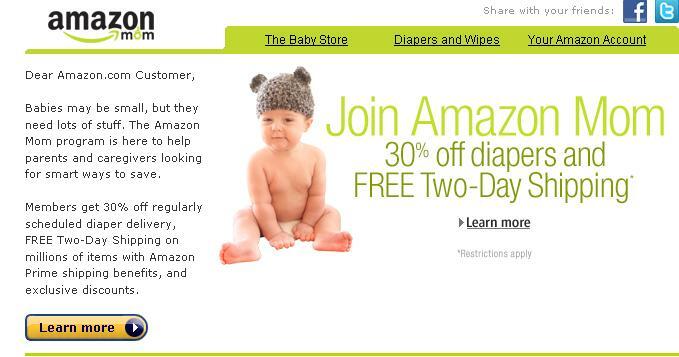 Amazon Mom is open to anyone who is responsible for caring for a baby or young child–“Amazon Primary Caregiver” just didn’t have the same ring to it. Kidding aside, we chose this name because we noticed moms in social communities (like our Amazon discussion boards) looking to connect and share information about products and problems with other moms. We wanted a name that would let these groups know that this program was created with their unique needs in mind. 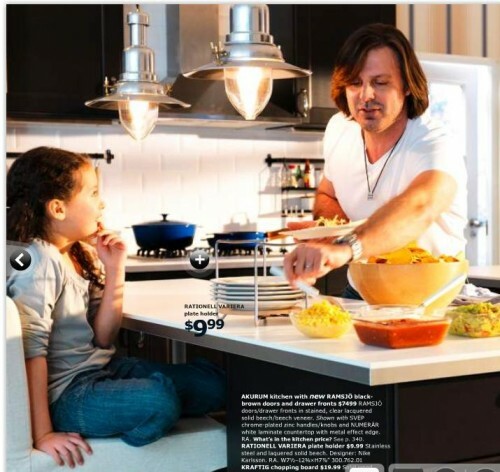 Leigh suggests that the images of involved, competent fatherhood might be the result of IKEA being a Swedish company. It’s possible that there’s an intentional ideological effort here to present men as caretakers (there is also at least one image of boys and girls playing with toys usually associated with the other gender). 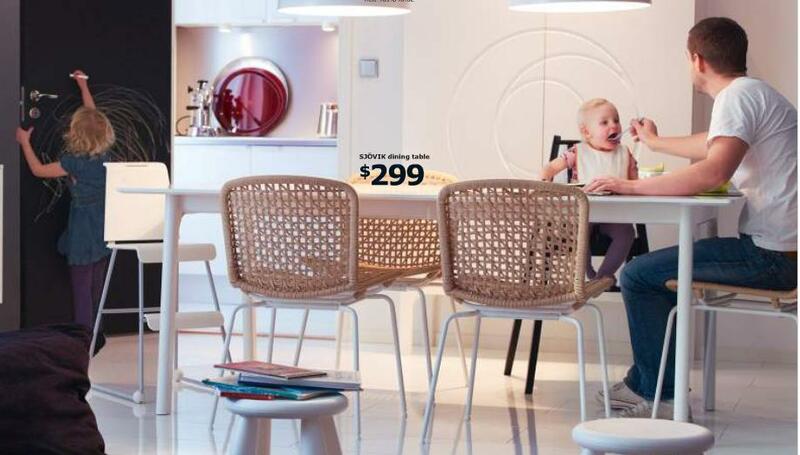 But also, IKEA markets itself as a somewhat youthful, hip brand, and showing non-traditional gender roles may fit well with that marketing strategy regardless of whatever larger social commitments to gender equality anyone at the company may or may not have. Whatever the reason behind it, the catalog — from a very large, profitable business (that apparently pays very little in taxes) — indicates that at least some companies think you can choose not to reinforce gendered parenting stereotypes and still manage to sell stuff. This being IKEA, that's probably a door with chalkboard paint on it so the kids can have fun. It's good to remember that Sweden (the country Ikea hails from) is also a country where there is very generous parental leave offered to both parents. Sweden gives fathers 18 months of paid paternity leave in addition to 480 days of shared parental leave. So it makes complete sense for Ikea's catalogs to feature fathers parenting- it's a normal part of Swedish life. It bothers me how weird these images seem to me. I feel like I don't often see images like this, with the father being nurturing and parental. I don't have kids, so I don't see it in my own home (though I'd like to think my fiance will be a good, nurturing father), and I never saw it with my parents, as at a young age my dad started taking extensive business trips while my mom stayed at home and raised us. The third image really struck me. The dad is wearing what I would call a "mom" outfit: comfy looking jeans and a plain looking baggy shirt. He's just by himself with the baby, just holding it, like any parental person would be, but for some reason it looks off because I'm so used to only seeing women like that. holy cow the dad is actually COOKING- and on something other than a grill! What's not to love about IKEA? And those first ads are just bizarre. They don't simply buy into the stereotypes. They seem to invent new ones. Last I checked, little girls love sweets and snacks as much as little boys do. And isn't the stereotype that WOMEN love to eat ice cream as far as adults go? Just wondering, because that seemed bizarre on top of all the obvious. I find it interesting that the man in the last two images (it is the same guy, right?) looks a little androgenous/feminine to me. Maybe I'm thinking that because of the stereotypically feminine context, but also the longish hair, something about the face, the necklace, and the head-tilt in the second one. It's nice to have this different representation of masculinity, but also surprising. I work for Supervalu, which is one of the US's largest grocery chains (we own Albertsons, Lucky, Osco, Jewel, CUB, Shaws, Star Market, and many others that I forget) and there is an initiative within the company called SHE, which is about "her" shopping experience. It entails things like making sure that grocery shelves are shorter (so that a 5'4" woman can reach the top shelf within asking for help), all of which are sort of cool on one hand, and sort of slimy on the other. I thought it was pretty funny that on the most recent run of rewards card applications, they have boxes for "Ms.," and "Mrs.," but forget to write "Mr." next to the third check box. We forgot that dudes do shop for themselves and their families. "First, apparently moms buy things only for their daughters and dads buy things only for their sons." May i ask why in the first foto mommy seems only to shop for the daughter and daddy seems only to shop for the son? There is no clear label, the only thing that can associated with gender are the colors, but isn't this blog always pointing out how ridiculous it is to associate colors with gender? or does the author think boys can't play with dolls and girls aren't playing the guitar? i think the headline "girl power" and boyish charme" refere to the gender of the parents and not to the content of the baskets. i'm not denying the other things pointed out, but any thoughts on this? I must say the IKEA images look very recognizable to me. I'm trying to take care of our daughter as much as my girlfriend does and many people around us are doing the same thing. When our daughter was born, I was lucky I could take a few months off to spend as much time at home as possible. I guess that's just the natural reaction for both men and women, however gendered expectation seem to differ. The video ad reinforces the outdated idea that men should expect their wives to clean their clothes. It's obvious that when husband spills ink on his shirt it's his wife's responsibility to fix it. I've been with my wife 15 years and I don't think she's even laundered my clothes. I saw another detergent ad this morning that showed a woman talking about how well she could clean her husband's work shirt. I'm thinking, what, this guy can't wash his own damn clothes? Anyone familiair with the cultural dimensions (hofstede)? I believe this holds the explanation of this article regarding the IKEA add. Scandinavian countries score prominently high on a particular dimension on the feminine verses masculine scale on the feminine side. This means there are less differences between male and female in that culture. There are even less differences in male and female character in feminine countries. Boys and girls like to play the same games for example and the traditional gender roles are less dominant. I read the book of Hofstede and it finally made sense to me why America differs so greatly from Holland, even though we are both western countries. Holland is a very feminine country and America is more masculine. So please take a look at the cultural dimensions. The book has very interesting explanations. 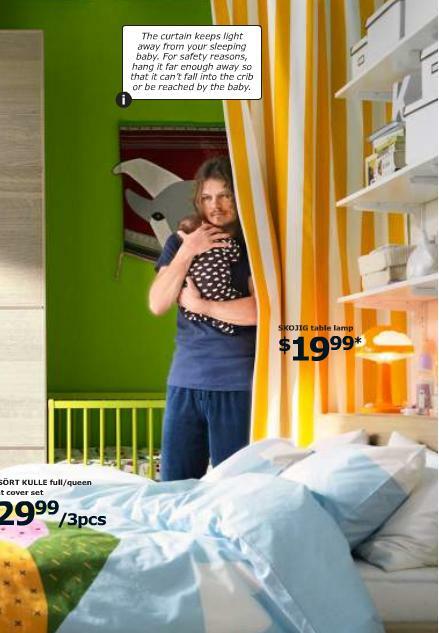 This IKEA add doesn't surpise me at all. “Amazon Primary Caregiver” is a mouthful. And the acronym "APC" already has a use in American English (perhaps other countries' Englishes as well) as "Armored Personnel Carrier." 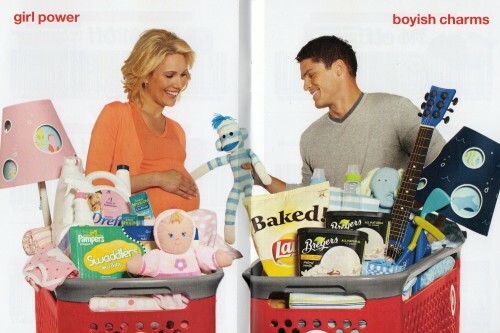 I think the point of the Target image is that Mom's hoping for a girl (notice she's heavily pregnant), while Dad is hoping for a boy, so they've filled up their respective carts with "girl stuff" and "boy stuff." Still problematic, for sure! Interesting that the word 'caregiver' is associated with mothers, but other neutral tags aren't: my mum was outraged that my college emergency contact forms asked for the numbers of "Father/Primary Guardian" and "Mother/Secondary Guardian". Caring for kids is clearly not a manly business, but "guarding" them is. And obviously two mums/two dads is totally not an option, and heaven forbid your child have more than two parents! What's wrong with Amazon Baby? An article in Slate talking about Swedish fathers and ideas of masculinity. One of the most interesting parts was that the Swedish government institutes programs to encourage fathers to stay at home with their children.